Interesting point to keep in mind when travelling out of State. Discussion in 'Law & Justice' started by delade, Aug 8, 2018. Each State has their own road/traffic violation 'ways'. Mobile phone video from a bystander shows Gray's arrest on 12 April around 08:40 local time (13:40 BST), on Presbury Street in the Sandtown neighbourhood of the city. Two men in yellow uniforms with "Baltimore Police" labels are seen pinning the black man to the ground. A court document says that Gray had "fled unprovoked upon noticing police presence". It also said that Gray "was arrested without force or incident". But state prosecutor Marilyn Mosby said that Gray was illegally arrested, assaulted and falsely accused of carrying an illegal switchblade. When the Baltimore man was arrested, he was alive and well. By the time he reached a police station, he couldn't breathe or talk. What happened? Gray died Sunday from spinal injuries. Baltimore authorities say they're investigating how the 25-year-old was hurt—a somewhat perverse notion, given that it was while he was in police custody, and hidden from public view, that he apparently suffered injury. Apr 28, 2015 - Upon loading Gray into the police van, officers claim he was “irate. ... underwent surgery for three fractured neck vertebrae and a crushed voice box. The voice box is within the C vertebraes, I think. So the question is not if whether or not an arrest occurred. It was videotaped. But was the arrest 'legal' or was it at 'officer discretion'? Which States have 'Officer discretion'? The others have 'set' limitations. In Illinois, going down/up a one way in the wrong direction is an automatic 75 dollar fine regardless of what kind of car or what kind of 'color' you are in.... I can be in a 'suit and tie' professional 'color' and I'd still get an automatic 75 dollar ticket if I went up/down a one way road/street in the wrong/opposite direction. And in the same light, I can get an 'Officer discretion' arrest or harassment in those above mentioned States, even if I was in a 'suit and tie' professional color car. The age old, 'good police, bad police', type of thing. Louisiana has one of the lowest minimum training requirements for entry-level police, at 360 hours. To be a licensed manicurist, you’ll need 500 hours. From NWA to PWA. Go figure. Strangely, these States seem to 'comply' with Federal Government a bit more than the 'standared' States. Maybe it's because DC is under Delaware and above Florida in the list. The Second Continental Congress approved the Articles of Confederation for ratification by the individual states on November 15, 1777. The Articles of Confederation came into force on March 1, 1781, after being ratified by all 13 states. On March 4, 1789, the general government under the Articles was replaced with the federal government under the present Constitution. A guiding principle of the Articles was to preserve the independence and sovereignty of the states. Historically, the tasks of local law enforcement, public education, public health, regulating intrastate commerce, and local transportation and infrastructure have generally been considered primarily state responsibilities, although all of these now have significant federal funding and regulation as well. Over time, the Constitution has been amended, and the interpretation and application of its provisions have changed. The general tendency has been toward centralization and incorporation, with the federal government playing a much larger role than it once did. There is a continuing debate over states' rights, which concerns the extent and nature of the states' powers and sovereignty in relation to the federal government and the rights of individuals. The Constitution grants to Congress the authority to admit new states into the Union. Since the establishment of the United States in 1776, the number of states has expanded from the original 13 to 50. Alaska and Hawaii are the most recent states admitted, both in 1959. The Constitution is silent on the question of whether states have the power to secede (withdraw) from the Union. Shortly after the Civil War, the U.S. Supreme Court, in Texas v. White, held that a state cannot unilaterally do so. Which means that the U.S can admit even 'newer' States. Although The Constitution is silent on the question of whether states have the power to secede, does it say anything about their own authority to separate States from the Union? Which State Wants Out of the U.S the Most? The "secession movement" on the White House open petition site now involves about half of the states of the U.S., which could be interpreted to mean we have more in common than we purport to, after all. Who wants it the most? You know how you and your best friend took a vow that you'd move to Canada if the presidential candidate you couldn't stand actually won? (Except, of course, you really wouldn't do that?) Now states are getting in on this game ... except states can't move to Canada. So instead, they want to become their own Canadas, sort of. The "secession movement," as posted by petitions on The White House's We the People site, now involves 21 U.S. states— many of them using the same "peacefully grant ... to withdraw" language below. Peacefully grant the State of ______ to withdraw from the United States of America and create its own NEW government. "...Governments are instituted among Men, deriving their just powers from the consent of the governed, that whenever any Form of Government becomes destructive of these ends, it is the Right of the People to alter or abolish it, and institute new Government..."
Despite an apparent eagerness to conform to one another in terms of the language used in their individual petitions to secede, Alabama, Mississippi, Georgia, Florida, Louisiana, Texas (whose language is different), Kentucky, North Carolina, North Dakota, Indiana, New York, New Jersey, Colorado, Montana, and Missouri are among those apparently fired up enough to start petitions claiming they want to go it alone. So, which state wants it the most? To what do I place a great deal of weight? This article was written in 2012. Roughly the same year that Churches began 'ordaining' LGBT Pastors and Ministers on the Public level. I'm not saying that LGBT persons are 'bad' persons, but what would they want to be a Leader of a Denomination for if they are uncomfortable with the requirements God has set forth for certain Church positions? All have their God-given job duties and requirements and responsibilities. Why has not any been 'let go' or 'fired' yet for not maintaining Standard Qualifications and Requirements? And so the whole debacle of WHO Church belongs to comes into question. Does Church belong to God or does it belong to man? And remember that 'Church' is often taken light heartedly all around the Globe. This applies to State and Country Leaders and Vice leaders as well. All who are in any kind of 'rule' seat or Authority. They were 'elected' in for a 'job tenure'. Theirs is a job. Sometimes a 4 year job. Sometimes longer. Sometimes indefinite. But still a 'job'. They get paid a yearly 'salary' for them being in that position doing those duties. It is their paid 'job'. After they retire or resign, another will take that or be elected into that 'job' seat. it is a job. A job which has duties and responsibilities to which the person being paid to do it should do it. Although that job is overseeing alot more than a small business leader, it is still nonetheless a 'job' with just as much need for diligence and uprightness to keep the Company in the profits and not let it sink as any other small Business needs to do in order to keep itself in the profits and running. And with each 'job' there is someone who is always the 'boss'. Many think the ladder ends with the State leader or President, etc. This is wrongful and false thinking. This is NOT true. NOT NOT NOT true. NOT an opinion that it is not true. But in fact and in factuality, it is NOT true. For the leaders that do not want to play the cat and mouse run around the bush game anymore. If you truly do not believe that there is a 'boss' over you, then let yourself be heard speaking outloud or inwardly that you do not believe it. This also goes to any Government seat holder or Department seat holder. At least this way, there is better hope for the upcoming persons who are not old enough yet and the elderly who are not able to defend for themselves against every false thing. Every field begins with the first new plantings. LORD, in The Name of Thy Only Begotten Son, (J)esus Christ, I ask Thee and thank Thee. Amen. There are many that really need to get into good employment for Good's sake rather than sitting around squabbling and being tossed around like cat's yarn by those that do not want to do their already possessed jobs rightly. And who is Good? Even (J)esus Christ did not call Himself 'Good' but gave Glory to God as being the Only Good. Mark 10:18 "And Jesus said unto him, Why callest thou me good? there is none good but one, that is, God." A primary word; "good" (in any sense, often as noun) -- benefit, good(-s, things), well. Compare kalos. Of uncertain affinity; properly, beautiful, but chiefly (figuratively) good (literally or morally), i.e. Valuable or virtuous (for appearance or use, and thus distinguished from agathos, which is properly intrinsic) -- X better, fair, good(-ly), honest, meet, well, worthy. Therefore, let Good be Good for Good's Sake. In The Name of (J)esus Christ, I ask and pray. Amen. And to think that it would have been so much easier to just have acknowledged that The entire World and Earth belongs to The LORD from the very beginning. And that to do the right for God's living ones on Earth would mean being in line with Heavenly Love and Good, many might not have needed to lose their jobs or lives. How in God's World and why in God's World should or does an 8 year old or a second grader need to commit suicide? CINCINNATI — A security camera video taken inside a Cincinnati elementary school reveals that a student assaulted an 8-year-old boy in a restroom and other children may have kicked and struck the boy for 5 minutes while he lay unconscious. Two days later, the child, Gabriel Taye, hanged himself. Authorities haven't released the name of the seven-year-old boy or that of his family. According to The Daily Journal of Vineland, the boy hanged himself. Either someone gave you a bad link or there's something funky going on. Either way, we're truly sorry for the inconvenience. and not even a possible 'looking into'? It has nothing to do with 'who' you are as an adult, able bodied. It has more to do with who they are, not yet adult and able bodied and retired and not as abled bodied. I've seen a person pepper sprayed, by police, while on the ground after another of the police who were there falsely accused the person of attempting to 'grab' the police's gun, while strangers were onlooking and then placed in the back of the police vehicle to only watch him, with eyes closed and hands cuffed behind his back, punched in the face by the officer as he sat in the back of the car trying to breathe normally as I could see the pepper spray and all that gunk go into the mouth and in and out of the nostrils as the person tried to breathe in a normal fashion. All this all because the person asked for the police to stand a few feet away from him until his supervisors should arrive to assess the situation even further. Strangely, the person who 'called' the police was not even around. He took off before the police even showed up and when the police was told that the person who called in left, the police still didn't care. There was no aggravated assault, there was no physical contact, there was no throwing of things, there was no endangering of life. Nothing.. not even the caller. The person who got pepper sprayed was just standing there by self minding their own business trying to see what might be for dinner, or something. I'm thinking to myself, 'that person is not even trying to reach for the gun. That person is too busy trying to not have the soda crash to the ground'. The person had other things too, I think. A cell phone, cigarrette, etc..
From where I'm standing, I see the person in a headlock on the police's left side with the others jumping on the person and the gun is on the right hand side. I didn't see any reaching of any gun, in fact, the person was too busy trying to keep his soda and his belongings in his hands. The stuff gets dropped because they are pulling the person down to the ground. The person is on the ground with the police doing some thing to the person's hands behind the back. One grabs his pepper sprays, bends down and aims it right into the face and fires for several seconds, 5 or more. The person is on the ground, with orange gunk running down to the pavement. The police stand there and talk to each other for about 10 minutes. They grab the person and put that person in the back of a car. The person can't open the eyes. The person is in the back seat. And I can see that person trying to gain some normal breathing because all that gunk is going into the nostrils and mouth. Then all of a sudden, the police opens the door and punches the person right on the side of his face and says something and then closes it. After that, I had to say some prayers and really ask God to be with that whole situation. I thought the other police was going to shoot the person because of the 'reaching for the gun' statements. In other words, that whole thing was just too strange for all of that physical drama. I could have witnessed a police shooting and would have needed to testify to the fact that I clearly did not see that person reaching or attempting to reach across the police officer's body to 'grab and or reach for the gun'. I mean, seeing an arm reach across the waist of a police officer or attempting to reach across the waist, where the gun holster is, would be way more noticeable than possibly yes, possibly no. But i keep wondering.. What happened to the 'caller'? Where is he/her? Why was the caller not around for the police he/she called for? What did the caller do? Just call and run? I might be able to call and give some report and not be there and let the police and whoever is there handle the meeting in their own ways and niceties? I'm not saying something didn't occur for the police to be called but could it also have been another 'fake child prostitution' sting call just like the one that triggered the pizzeria invasion by a vigilante rifle holding good samaritan? It's not clear why Barriss allegedly received the Wichita address. The victim's mother told KAKE that her son did not play video games, suggesting a possible case of mistaken identity. "I hope they charged him with something substantial. It should be a crime of what he did," Finch's mother, Lisa Finch, told KAKE. In the Wichita prank call, the caller said someone had an argument with their mother; that the father was accidentally shot; and that a brother, a sister and the mother were held hostage, Wichita police Deputy Chief Troy Livingston said. "We learned through that call that the father was deceased, shot in the head. So that's the information we were working off of," Livingston said. "Our officers came here preparing for a hostage situation. Several got in position. A male came to the front door, and one of our officers discharged his weapon." Police said they shot Finch after he moved his hands to his waistline, Livingston said. He was taken to a hospital, where he died. Livingston said Finch was not armed and nobody was found dead at the home. He called the shooting "tragic and senseless." And still we have so many individuals saying, 'Please don't talk about that Religious Morality Stuff'. 'I'm getting sick of Religious Morality stuff'. Strangely though, they never seem to not listen to the lady pastors and Evangelists. When did a lady Preacher or Pastor or LGBT Preacher or Pastor EVER get slack from the public audience? EVER? Probably not yet. Maybe even NEVER. Those that know the difference between right and wrong and are working for the 'right' rather than the 'wrong' are already in God's Company. They don't really need to worry. For those that question what right and wrong are, then they might need to have a refresher course of what their original intentions of wanting and becoming a Leader was.. Probably to help rather than cause. Revelation 2:4 "Nevertheless I have somewhat against thee, because thou hast left thy first love." And what better way for a stray person than to take time leave so as to regain that which was lost, namely their soul and heart, instead of getting deeper and deeper into things they never planned from the very beginning. Might some of the Police involved in public shootings, even to innocent ones, never have imagined themselves as being such from their very early police career advancements? They probably would have done things differently if they were in their right frame of mind, right? How did they get out of their right frame of mind? Mr. Trump addressed this briefly when he asked for some time, with the travel ban; not Muslim ban, to get things sorted out.. Was he or his administration granted some peace and quiet so they could 'figure out' what was going on? NO. More noise, more rowdy, more noise. So the first real pertinent question might not need to be: 'Are you a believer'? But it might need to be: 'Are you okay'? Upstairs, in your brain and in your thinking and understanding, etc, are you all there'? I hear people talking and all of a sudden one person will say something so off the wall and then I see the other person slide the conversation into a different direction. And I'm standing there wondering, what the heck? Sometimes it happens with me also. But when it does, I tend to ask what the person meant by the statement. And often times, it is them who ends up sliding the conversation into a different direction with a little embarrassment on their faces. But I really do not know from where mass 'mental' un-clarity is coming from.. I do know that in 2015, NASA found a hole in the Sun the size of 50 Earth's Wide. Could that have something to do with all of what occurred? 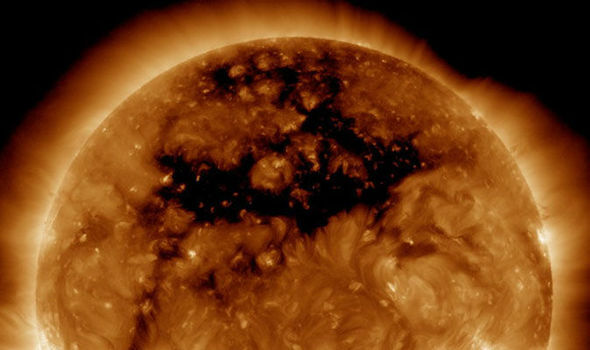 ONE of the biggest "holes" ever in the Sun's outer layer developed blasting solar winds and radiation at our planet. Only now are people 'ready' to read about this and take this matter 'seriously'. Before, they thought it all to be a joke or a prank. Don't think that the Sun 'patched' itself up. The hole is still there just as we are a little bit 'more there'. The hole can be either 'denied' over or 'accepted' over. Or just completely think it to be a joke or a prank..
Or some malicious way of getting people to look up and not always around. Many say that natural disasters are the handiwork of God. I can show how it isn't. Psalm 145:17 "The LORD is righteous in all his ways, and holy in all his works." what occurs when mass inland heat is taken out into colder waters to intermingle? So if God isn't the One who is causing all the tornadoes, hurricanes, tsunamis, earthquakes, volcano eruptions, etc, what is? And if God isn't the One who caused all the tornadoes, hurricanes, tsunamis, earthquakes, volcano eruptions, etc, who or what caused the hole in the Sun? Fine, granted... Okay.. so because the Sun HAS a hole in it, what is humanity going to do WITH it? Keep in mind that the Earth population is at around 7.6 Billion today. How many of us are going to be around in 82 years? In the year 2100? Well, the estimated Earth population in that year is estimated to be at 11.3 Billion. And the 'hole' is probably STILL going to be there. How is that 'hole' effecting Earth and the soil and all other things? Is it going to be a beneficial thing for those who will be on Earth in the year 2100, 82 years from now, or will be a more 'detrimental' thing for those who will be on Earth in the year 2100, 82 years from now? Do we want to help them ease into life with a little less murk and alot more provisions to their day(s) or do we want to let them deal with it when they come around and hope they will be given the proper information to do something if they choose to? But if the Sun can heal itself or if the Sun can be patched up somehow, what are the expected wait times? This 'hole' does not ONLY effect planet Earth... it effects the Earth's entire Solar System. Just how 'long' is 50 Earth's Wide? 7,917.5 x 50 = 395,875 miles. But the Earth's moon is around planet Earth. Which would be around Earth in the above picture rather than around Venus or another planet. I don't know if the above picture is true to size but if it is, take 50 Earths and place them in the Sun, and that is the size of the 'hole' in it. Want to see something really amazing? The Milky Way is the galaxy[nb 1] that contains our Solar System. The descriptive "milky" is derived from the appearance from Earth of the galaxy – a band of light seen in the night sky formed from stars that cannot be individually distinguished by the naked eye. How many 'Stars' or 'Suns' are there in this Galaxy? 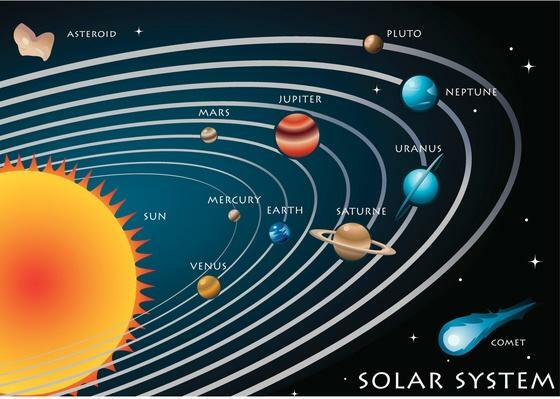 For many years scientists have studied our own solar system. But until the last few years, we knew of no other solar systems. This may seem surprising, as the Sun is one of about 200 billion stars (or perhaps more) just in the Milky Way galaxy alone. According to the best estimates of astronomers there are at least one hundred billion galaxies in the observable universe. They've counted the galaxies in a particular region, and multiplied this up to estimate the number for the whole universe. 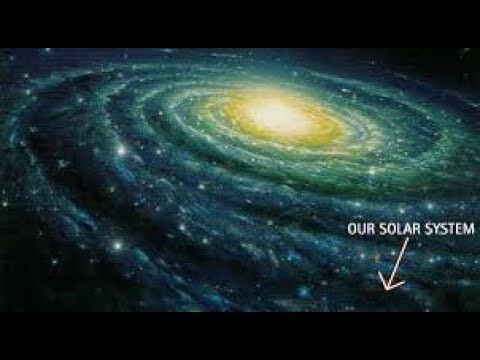 So 100 billion Galaxies with about 200 billion Suns or Stars in The Milky Way Galaxy alone would mean that the observable Universe is really really BIG, right? And on Earth is where all our Nations are on right? And on Earth is where all the Islands are on, right? Yes. Okay. So how large is a bucket to a person?? Isaiah 40:15 "Behold, the nations are as a drop of a bucket, and are counted as the small dust of the balance: behold, he taketh up the isles as a very little thing."